News :: Spirit of '45 Honors the Gold Stars of the Greatest Generation on Memorial Day in Washington, D.C. Hundreds of youth carrying photos of the fallen of WWII march up Constitution Avenue in the National Memorial Day Parade in May each year to raise public awareness about National Spirit of '45 Day in August. Each youth represents 1,000 of the more than 400,000 who made the ultimate sacrifice during the war. To help raise public awareness about Spirit of ’45 Day, the "Keep the Spirit of '45 Alive!" collaborative organized a Memorial Day of Service in the nation’s capitol to honor those who did not return home after World War II ended on August 14, 1945. 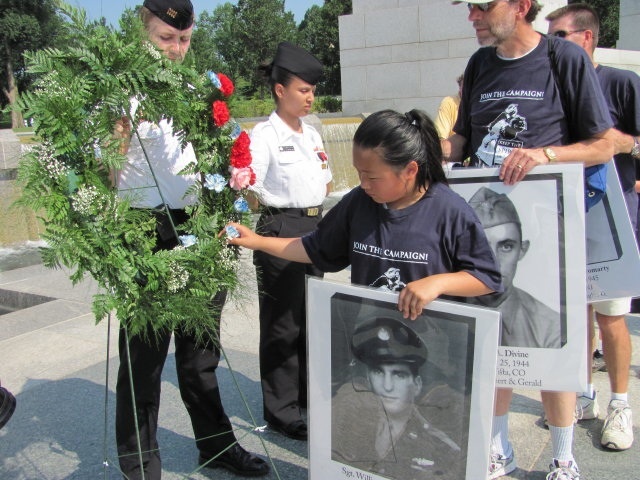 On May 28, 2011, hundreds of youth gathered at the National World War II Memorial to participate in the annual Memorial Day wreath laying ceremonies hosted by the Friends of the National WWII Memorial. Attending the ceremonies were several senior military officers, including the Chairman of the Joint Chiefs of Staff Admiral Michael Mullen, actors Gary Sinese and Joe Mantegna, singer Nancy Sinatra and others. Each youth carried an enlarged photo of one of the 400,000 Americans who made the ultimate sacrifice in service to our country during WWII. Among the photos carried to the Memorial this year were Joseph P. Kennedy, Jr., the Five Sullivan Brothers, the Four Chaplains, Japanese Americans and Latinos who posthumously received the Medal of Honor, and more than 100 of the more than 2,400 sailors and marines who were killed during the attack on Pearl Harbor, including Admiral Isaac Kidd who died aboard the USS Arizona. Admiral Michael Mullen, Chairman of the Joint Chiefs of Staff receives Spirit of '45 National Leaders Medal from Gold Star Mother Laura Spencer during 2011 Memorial Day wreath laying ceremonies at the National World War II Memorial as Robert Corpus, Gary Sinese, Joe Mantegna and others look on. At the end of the ceremonies, our Spirit of '45 youth placed red, white and blue flowers in wreaths donated by Joseph Grawler's Sons for each of the service branches and the Home Front as a group of buglers played "Amazing Grace" and "Taps" to conclude the ceremony. The buglers were recruited by Ed Bilger, Associate Director of Bugles Across America, who is helping to mobilize 1,945 buglers for an annual cross country performance of "Taps" on National Spirit of '45 Day. Click here for more information about "Taps Across America initiative. Following the ceremonies, the Spirit of 45 youth joined the National Memorial Day Parade and marched 10 blocks up Constitution Avenue (in 100 degree heat!). Click here for the 2011 media release. Click here for a copy of the 2011 flier. Click here to more about how youth are being engaged to help keep the Spirit of '45 alive in America! Click here for information about the 2012 Memorial Day of Service. at the National WWII Memorial during the annual Spirit of '45 Memorial Day of Service in Washington, D.C.